After establishing their name as one synonymous with hops, Japanese monsters and, frequently, steepling levels of booze, KAIJU! decided they should probably have a beer in their lineup that was a little more approachable. One that could be consumed in rather greater numbers. It's something you see from pretty much every brewery at some point, no matter how out there their schtick. Yet, with KAIJU!, approachable still means only a notch or three under the 6 percent ABV mark. 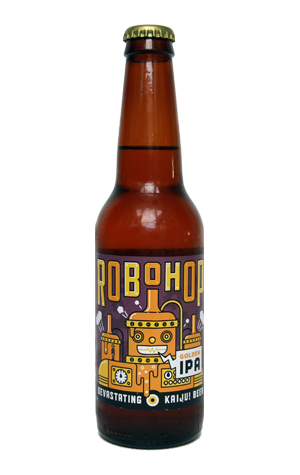 Robohop is that beer – the first in their lineup sub 6 percent and also the first to feature a hero on its label as opposed to a kaiju (with heroes being the folks that battle kaiju in monster mags and movies). Since first appearing, it's been reworked a little (following a trip to the US spent drinking San Diego pale ales) to become the first of their beers to feature a non-American hop. Enigma is the lone Aussie making an appearance, with the beer offering a broader, gentler bitterness than the majority of KAIJU! beers, one with hop aromas and flavours of peach, nectarine, melon and grape.